Donation made in the name of Gill Family. 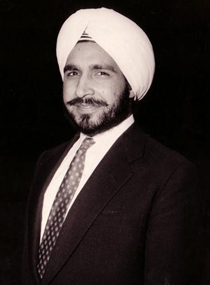 Jagtar Singh Sidhu was born on October 1, 1928 in Lyalpur, India, which is now known as Faisalabad, Pakistan. Nearly twenty years later, during the partition of India and Pakistan, he moved back to his family’s original village Sidhwan Bet, Ludhiana District, in eastern Punjab, India.Always interested in higher education, Mr. Sidhu went on to receive his master’s degree in chemistry from Aligarh University in Uttar Pradesh, India.In 1953, at the age of twenty-four, he left India for England where he attended Imperial College in London, earning a second master’s degree in the science of food and drugs and a diploma in chemical engineering. 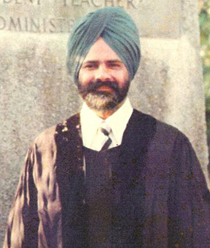 While at Imperial College, Mr. Sidhu was very active in the Sikh Student Federation.This was just one way of expressing his many interests, including religion, history and Sikh politics.After finishing his studies, Mr. Sidhu remained in England and worked as a food quality controller. In 1960, he returned to India and conducted forensic science work for the Punjab Police in Chandigarh as the Assistant Director of Police.Never one to stay in one place, Mr. Sidhu again returned to England in 1965.He met and married Gurmeet Kaur Grewal in 1967.They raised one daughter and two sons together.In 1975, the Sidhu family immigrated to the United States, settling down in Yuba City, California.They liked Yuba City for its rich Sikh cultural heritage, which they wanted to share with their children.In California, Mr. Sidhu returned to his Punjabi agricultural roots and began farming peaches, while Mrs. Sidhu continued her work as an educator with Migrant Education.In the late 1970s, he taught English as a second language to Punjabis aspiring to become United States citizens. 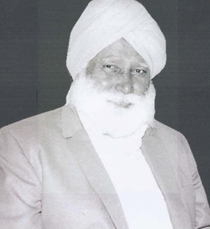 Mr. Sidhu was an active member of the Tierra Buena Sikh Temple and was concerned about the lack of a community-based youth center for teenagers and the welfare of the Sikh community’s elderly residents.He looked for ways to enhance the cultural activities of these groups.Mr. Sidhu’s three children earned bachelors’ degrees at the University of California, Berkeley and went on to work in professional careers.Mr. 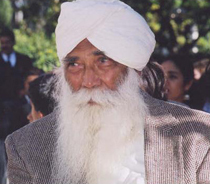 Sidhu sold his farm in 2004.He enjoyed reading, gardening and taking walks with his wife during his retirement.Jagtar Singh Sidhu peacefully passed away on May 29, 2007, surrounded by his family. Looking across their village Shankar in Punjab, India, brothers Bakhtawar Singh Purewal and Udham Singh Purewal knew there was a better life to be lived. These men, with a vision, wanted to create something more for their lives, and for future generations to come. 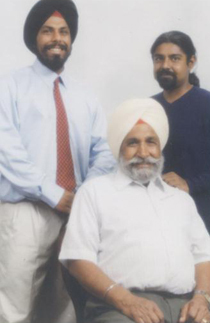 Their Uncle Gurbachan S. Purewal was already in America, and holding the key to their future. Together they made the choice they would leave their village and migrated to America. With a 5th grade education and $10.00 in his pocket the eldest sibling, Bakhtawar S. Purewal, took the courageous step and made his way to America in 1951. He worked on local farms for a few years and then returned to India in 1955 to marry Harbhajan Kaur. It was also this time that he sponsored his brother Udham S. Purewal who arrived in California on June 17, 1955, leaving his wife Prito Kaur behind along with his two sons (Rashpal and Narinder). Now both brothers worked on various farms in Colusa, Mendota, Woodland, and Yuba City before purchasing their first 40 acre grape farm in Lodi, California. 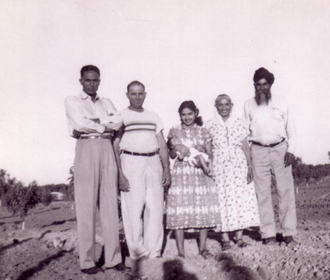 Harbhajan Kaur arrived from India in March of 1959, with Prito Kaur arriving with her two sons in 1962. In the years that followed, Bakhtawar's family grew with the births of three daughters (Sukhbinder, Sukhjinder, and Gursharon) and two sons (Sukhdev and Munjit) Udham Singh's family grew with the births of two daughters (Sukhcharanjeet and Sukhjit, and another son, Satnaum. With limited English speaking skills and a lack of general resources, life was incredibly hard for the Purewal families (as it was for all new arrivals). They sold the 40 acre grape farm in Lodi and decided to settle in Yuba City, since most of the Punjabi families migrating from India were settling there. 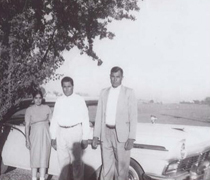 It was with determination and a strong sense of perseverance they saved enough money to purchase their first piece of land in Yuba City in 1957 and continued to build a successful farming business and prospered by purchasing additional land through the years. By the Grace of God Bakhtawar Singh and Udham Singh were able to donate land in 1967 to build the third Sikh Temple in California, the first in Yuba City. Both brothers were active members of the Tierra Buena Sikh Temple (Yuba City) with Bakhtawar serving as elected member of the Board for many terms and Udham providing service mainly in the Langar (kitchen) area. Both brothers were very devoted to their sewa (service). 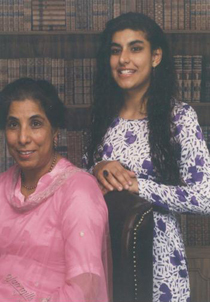 Over the years, Bakhtawar and Udham sponsored many family/friends so they could immigrate to the U.S. Both brothers will be remembered as kind, gentle, and generous hearted. Their story is a prime example of achieving the "American Dream". 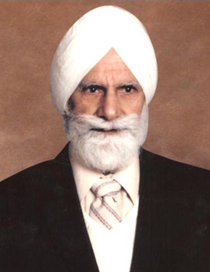 Bakhtawar Singh Purewal passed away in 2004 and his story will live on through family and friends. Udham Singh Purewal continues to reside in Yuba City with his wife and children. Dedicated to the loving memory of Sardar Nihal Singh Ghuman, Mata Piar Kaur Ghuman, their son Dr. Joginder Singh Ghumman, and Tarlochan Singh Ghuman. Their hard work, honesty, and dedication towards family and being helpful to others will always serve as an inspiration to us. A dedication to our late grandparents, Sohan Singh Kalkat and Amar Kaur Kalkat. May their lives always be remembered. Born on August 10, 1919, Sohan Singh Kalkat was raised in the village of Kalkat in the Hoshiarpur district in Punjab. 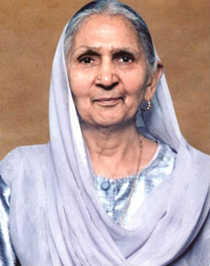 Born on February 3, 1921, his wife-to-be Amar Kaur Kalkat was raised in the Five Chak Lahore in West Punjab. In 1947, after Punjab was separated by the Partition of India and Pakistan, Kaur migrated east to the village of Talghar in the Hoshiarpur district. Decades later, Sohan Singh migrated to Live Oak, California in May of 1970. 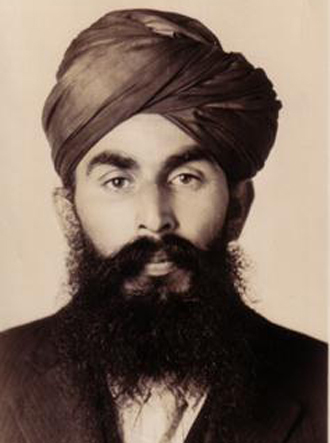 Amar Kaur joined him in May of 1971. Sohan and Amar played an important role in the Punjabi Sikh community in the Live Oak area; they were founding members of the Gurdwara Sahib Gridley Live Oak. Sohan and Amar were very well respected and their presence is missed by the entire community. 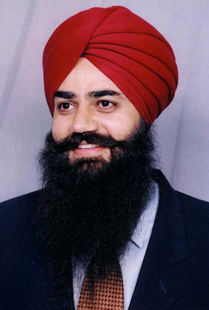 Sohan Singh and Amar Kaur have one daughter, Surjit Kaur Dhami and two sons, Surinder and Amrik Singh Kalkat, living in Live Oak and Gridley, California respectively. They have ten grandchildren, and fourteen great grandchildren. We owe a lot to our grandparents and were truly blessed to have them in our lives. They had the warmth of our parents; the wisdom of the sages; and the hearts of gold. Sardar Karm Singh Bains was born in 1902 in the village of Nangal Kalan, District Hoshiarpur in Punjab. In 1923, Karm came to the United States, leaving behind his wife Kartar Kaur and two sons. He followed the path of previous Punjabi pioneers in his family. His uncle, Baba “Fahla” Dalip Singh, was among the first wave of Punjabis to North America, arriving in 1899, and was also a founding member of the Ghadar Party. After Karm arrived in Yuba City nearly twenty-five years later, he found work on various farms and began saving money to one day purchase his own land. Because of strict immigration laws, Karm was unable to reunited with his family until the late-1940s when new legislation was passed. Karm purchased land and a house on what is now Bridge Street in Yuba City. There he and his wife Kartar, who came in 1949, made a life for themselves. As one of the few men in Yuba City with a Punjabi wife, their home on Bridge St (then known as Whyler Rd) was a central meeting place where newcomers were greeted and men often left belongings for safekeeping while they returned to visit India. Karm’s two sons made sure to earn a good education. 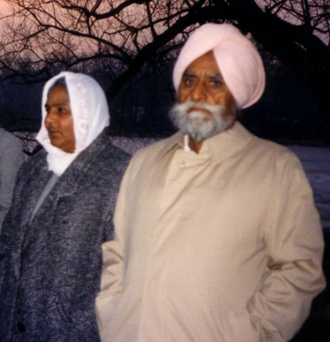 After they arrived in America, Joginder earned his PhD in political science and Resham got a degree in agriculture. Karm was known as an honest and religious man. He did not like debt and therefore bought everything outright. He passed away in 1971. Three year later his wife, Kartar Kaur passed away. 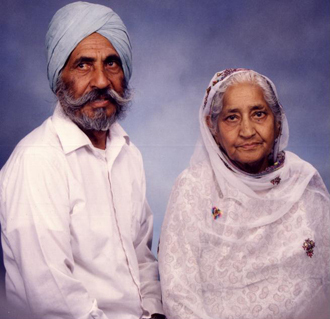 The family continues their legacy in part through Resham who immigrated in 1963 with his wife Gurjit Kaur. Together they had five children: Nakshatar Kaur, Tejwant Kaur, Parminder Singh, Ravinder Kaur, and Gurpreet Singh. They will always remember and admire the sacrifice their grandfather made for the family. May his life be lovingly remembered. In memory of my father, S. Lachman Singh Bajwa. His kindness, hard work and love for his family and fellow human beings continues to guide me everyday. 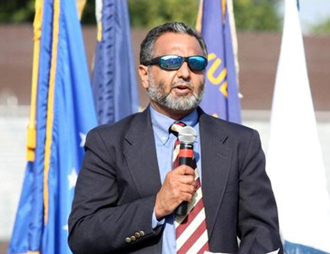 Dr. Bajwa read a Unity prayer that he wrote and which was originally read at a Unity gathering at Yuba City Town Square in September of 2001, after the attacks in New York, Washington, and Pennsylvania, and attacks on Sikhs across the United States, including Arizona. A portion follows. "O Merciful God, shower the earth with your love and kindness...put out the fires of hatred and anger. O Ruler of Rulers, with your brightness of knowledge, with your world-filling light, dispel the darkness of prejudice. Also today, soldiers from this, our land of the free and the home of the brave, have set forth to fight evil. Be their shield, shelter them from dangers, but also, O Fearless One, give them courage when facing the enemy, that they may strike at the heart of evil and injustice."